A school’s drop-off loop affects every part of the organization. Not only is it tough on parents and administrators, but a bad drop-off loop has been linked to negatively affecting both the environment, and the health of our children. Plus, as school choice and commute distances increase, it’s affecting how parents choose the next school for their child to attend. But here’s the good news: without completely redesigning your school loop, there are some relatively easy ways to optimize your existing system. Different modes of transportation running into each other can drastically slow down your loop. By separating these as much as possible, you can provide safe and efficient access to school for students. Separate Bus & Parent Drop Off Areas: Have your buses drop off in a separate area from your parent drop-off loop. Having these two in the same area, let alone same lane, can lead to major backups. Safe Routes to School suggests you locate buses so that they exit upstream of cars and gain priority, reducing delay. Segregate Pedestrians and Vehicles: Keep pedestrians out of the way of automobiles, and vice versa. Best practice is to map out how pedestrians enter school from biking, walking, or being dropped off, and make sure they don’t cross through a drop-off lane. Separate Parking Vs. Drop Off Areas: Separate areas where parents are allowed short term parking versus drop-off where parents must stay in their cars. Mixing the two causes confusion and backup. Staggered Dismissal Times: Consider staggering drop-off and dismissal times based on transportation mode or grade grouping. This can reduce pedestrian and bicyclist exposure to and conflict with motor vehicles, as well as cut queue length and idle time. Although it may seem intuitive, many parents get confused by old, unclear, or nonstandard signage and markings. Auditing and correcting such drop-off necessities can streamline the entire process. Pavement Markings: Make sure your pavement markings are correct, including curbs and road markings. Using standardized colors for these markings will make sure they are easy to understand. (And fixing the problem is cheap.) 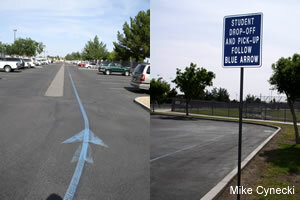 Some schools even put lines with arrows to follow on the loop pavement. Leverage Signage: Proper signage can be tricky! It is recommended that schools keep signs to short, clear language and use standardized sizes, shapes, colors, and heights. Any leaning, faded, or verbose signs should be replaced. Also consider having signs in multiple languages to accommodate your parent population. Use Bright-Colored Cones: Cones are actually a great tool for traffic control, and can be used to guide traffic or restrict access. Replace discolored or old cones with new ones—parents will disregard cones that look defunct. Here’s an easy way to upgrade your drop-off loop: take some cars out of it! By encouraging and supporting other means of transporting student to school, your drop-off loop will be less burdened with automobiles. Set up a Walk- and Bike-to-School program. There is a wealth of resources available to schools looking to do this, such as the National Center for Safe Routes to School. Not only is it fun for students, but also cheaper, healthier, and better for the environment. Facilities To Support Transportation Alternatives: Provide facilities for students using these alternate modes like buses to public transit, a bus to pick up walking students at a nearby location, crossing guards, and bike storage. Having these in place will lower the barriers for students to use these modes. Implement School Carpool: Not only will this reduce congestion, but it will save parents time and gas money. Pogo can help parents find and organize carpool rides for their children, making it a breeze for them to start carpooling. All parents have to do is enter details about their school and extracurricular carpool needs, and Pogo will automatically generate a balance carpooling schedule with other parents in their area. Check it out! Now you have a few ways of optimizing your existing carpool loop. Of course, all of these methods need to be supported with strong and consistent parent education to be effective.